Swatch plans on building a smartwatch to in the next few months to compete with the debut of the Apple Watch, reports say. Swatch, known for trendy, plastic watches, will create the new device that will make mobile payments, use near-field technology and won't have to use a a charger, according to Bloomberg News. Chief executive Nick Hayek made the announcement in an interview, also saying the new smartwatch would be on both the Windows and Android platforms. 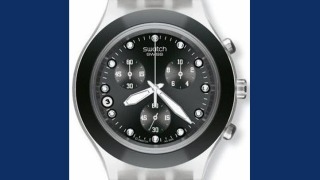 Despite being known for brightly colored plastic watches, Swatch has been quietly developing watch technology for the last 20 years including skinny, long-lasting batteries and touchscreens with altimeters, compasses and sensors for depth. Despite Hayek's previous skepticism about smartwatches, apparently he realized that there's a potential $10 billion market for them. It's interesting how Swatch seemed to sit back and watch the evolution of the Apple Watch and other wearable devices before deciding to enter the market. Although some might call this too cautious, the company didn't want to go in without some careful consideration. Luckily, the company already has decades of watch innovation to compete in the marketplace, so it will be interesting to see what kind of product it produces and how much competition it will be for Apple.